Video showed Denis O'Connor sitting at Bar One Racing in Glanmire, County Cork, on Saturday evening when the masked would-be thieves burst into the venue. Two of the men rushed the counter and demanded money, threatening the store manager Tim Murphy, while the other pointed his shotgun at O'Connor. Moments after, he jumped into action and wrestled with one of the men who was waving a hammer, eventually forcing him to flee. And once O'Connor grabbed a stool, he scared off a second man who was carrying the shotgun. Meanwhile, Murphy tackled the remaining robber, who then decided to retreat –– but not without O'Connor landing a final kick. Murphy told Irish media outlet RTÉ he was thankful for O'Connor's timely intervention. "I owe Denis a huge debt of gratitude it was an incredible act of bravery from him," Murphy said. Garda Superintendent Mick Comyns says local police are looking for the men. He also said that while O'Connor and Murphy were able to foil the robbery, their advice is for people not to intervene. 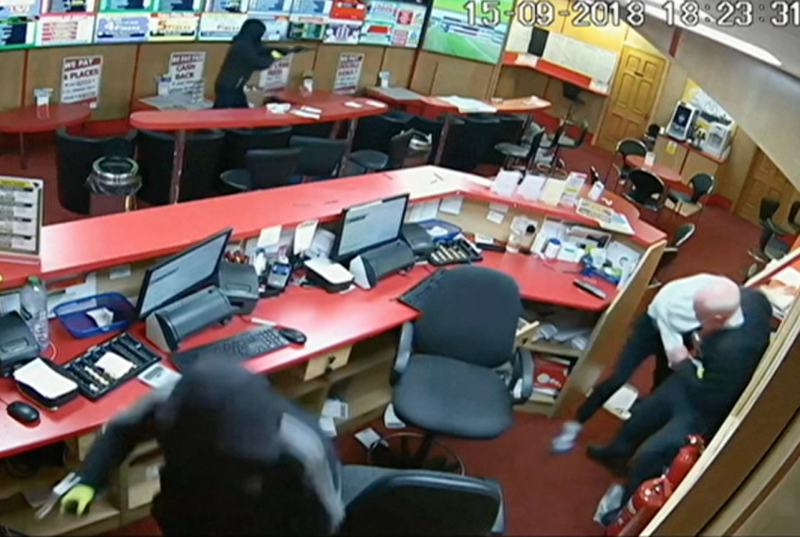 "There is a huge risk factor in trying to take on people who come in to carry out a robbery," he told RTÉ. As for his newfound fame, RTÉ reports O'Connor declined interview requests and played Par-3 golf Monday morning. He is apparently anxious for the publicity to blow over.